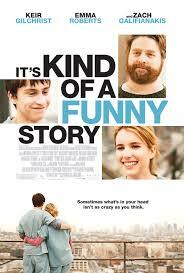 “It’s Kind of a Funny Story” was based on Ned Vizzini’s most popular novel of the same name. It follows Craig Gilner, a gifted and depressed teenager, after he checks himself into the hospital for suicidal thoughts. Due to construction taking place at the hospital, he’s housed with adult patients of the hospital’s mental health unit, as well as with teens, and meets some very interesting people as a result. Overall, I found this film underwhelming. Even though the movie had enjoyable moments, the screenwriters/directors Ryan Fleck and Anna Boden lost tons of great detail in their adaptation of the book. This, of course, is unavoidable in adaptations to some extent, but they rewrote most of the book in a way that neither kept its themes nor respected its plot. Another negative was Keir Gilchrist’s performance as I feel he played the role of Craig in a very flat and un-emotive way. His depression was unbelievable in the sense that he seemed more apathetic towards everything than grasping at straws to survive or desperately seeking a way out. It didn’t help that Craig’s suicidal thoughts were thrust upon the viewer seemingly out of the blue. There was no progression, build up, or climax. There was just this boy riding a bike to the hospital at 5AM to keep himself from committing suicide. Where’s the panic or debate or guilt at potentially leaving his family (which is cited later in the movie as one of the reasons he didn’t kill himself)? All of these emotions were both motivators for suicide in the book as well as reasons not to go through with it. In relation, the movie would have benefited if the backstory was explained in the beginning as opposed to sporadically throughout the movie. The way the editors pulled the audience’s attention this way and that in the opening scenes is confusing and misleading. Something which upset me was Craig’s improvement in the movie. For the first few days, he really doesn’t improve in the slightest. He even stress vomits multiple times. Now, consider that this novel was Ned Vizzini’s most autobiographical work and, in it, Craig’s new environment makes him at least a little bit more comfortable at the start. To undermine Craig’s progress, and inadvertently undermine Vizzini’s progress that he’d made in a mental hospital himself, is insulting to the writer, his readers and those actually struggling with mental illness themselves. It doesn’t paint a realistic picture of how things works; it paints the “Hollywood” version which is less truth and more sensationalism. Despite the poorly written script, the majority of the cast really tried to bring the movie to life. However, only one truly succeeded. Emma Roberts’ acting as Craig’s love interest was basic at best – she was monotonous and skirting the edges of anger throughout the movie. Zach Galifianakis’ performance as Bobby, Craig’s adopted best friend in the hospital, was admirable but slightly detached – it was almost as if he was an angrier version of his character, Alan, from “The Hangover”. Some people might have enjoyed that about his acting, but when I see an actor in various movies, I want to see the various characters, not the actor playing his characters. Surprisingly enough, it was the minor characters who really took center stage. I was very impressed with Jeremy Davies as Smitty, Thomas Mann as Aaron, and especially, Bernard White as Muqtada. Smitty basically runs the psychiatric department and Jeremy Davis really captured his hippie-vigilant attitude, and you really believed he wanted to help each and every patient. In the story, Aaron is Craig’s best friend who is made out to be a villain but, in the end, Mann is able to convince the audience to empathize with him, even more than in the book, in my opinion. His emotion seemed genuine and for such an emotionally charged movie, it really shouldn’t have been so hard to find true emotion. Finally, Bernard White as Muqtada was a tragically funny character. He was his character’s depression but he was also more than that. He allowed the audience to see that people with mental illness really are still people, just people with some extra struggles to overcome. He was empathetic, sympathetic, funny, and a key character that sticks with both the themes of the movie and the book. I was also pretty impressed by the score which was written mostly by Broken Social Scene with contributions from various other artists. A good score affects the audience’s emotions without them even realizing it, and truer things couldn’t be said about “It’s Kind of a Funny Story”. In scenes that may have otherwise lacked depth, music pulled at my heart strings and allowed me to feel for the characters in ways that the script, acting and-or picture did not. There’s a scene towards the end of the movie that features Noelle and Craig having a heart to heart; the score for this scene is beautiful and compelling but is offset by the glossing over of the “sappy” parts in the scene. Instead of getting the nitty-gritty meaningful conversation that the audience wants to see, we get a photo montage and voiceover explanations. It’s simply unsatisfying. That stylistic choice may have been wrong for Noelle and Craig’s scene but it was right for the end sequence. The montage-voice over pair gives the film a unique ending that almost makes up for its earlier mistakes.